Learn which vest and suit button rules apply and never wonder “am I wearing this correctly?” again. We’re not big on rules, but we stand by the “never button the last button” rule. Vest or no vest, buttoning the bottom button will make you look like a rube, plain and simple. If you do have a vest on, the bottom button on the vest ought to remain unbuttoned as well. To learn how to wear a vest casually solo, read here. When it comes to the rule of buttoning your suit when you’re standing and unbuttoning when you’re seated, you have a bit more leeway. When you’re seated, definitely unbutton. Sitting with your jacket buttoned puts unnecessary stress on the button closure which in turn can lead to potential garment disasters. Adding a vest to the mix will only put more strain the button, causing an odd pulling in the chest and through the back. When you stand, if we’re speaking true formality, button up. On the other hand, a three-piece suit with the vest buttoned and the jacket open can exude a nonchalance that looks pretty boss (see the above photo). I have navy blue upper and ice blue waistcoat .which color pant or trouser should I wear ?? Well, you can’t go wrong with matching your pants to your blazer, but it sounds like charcoal gray trousers would coordinate well with this outfit too. And what color of bow or tie should I have to wear ??? Your outfit sounds like a good contender for a navy tie or bow tie if you want to add some punch to your look. Vests for man and women are an excellent choice for making their ensemble look trendy, fashionable and useful at the same the time. These vests are usually made of comfortable material which makes it possible to wear them for long hours as well. You’ve got that right, Rich. In fact, some of our favorite vests are made from a wool/cashmere material, like this one. Vests are especially great in the colder months when you need another layer of warmth. Hey, i was wondering if a royal blue vest would go well with grey pants and a white or navy blue shirt? We’d recommend the white shirt, not the navy blue one, with a royal blue vest. The two blues could look a little strange together. So that answers this particular question, however, if you were a Compass subscriber you’d have seen our articles that go into much more depth on why it’s important to pick clothes colors not because they go with each other, but because they go with you, like our articles on Mastering Men’s Fashion From the Inside Out and how to Pick Shirt Colors That Match You, Even If You Have No Eye For Matching. To get articles like these sent straight to you regularly, so you don’t have to hunt around for this stuff, enter your email address in the box below and subscribe. Hmmm…we were referring to the bottom buttons on jackets and vests , Raghav, not the top buttons on shirts. Sounds like you’re referring to a more casual setting where anything goes. What color of necktie would match a vibrant rose dress shirt? Without seeing it, it’s pretty hard for us to come up with a match, but here’s how we styled our own red shirt into a photo shoot with a simple blue knit tie. So curiosity is killing us and we gotta ask: what about the above article made you think of this question? Beg pardon, but does it take a Yank, like myself, to bring up the explanations for leaving said button undone? The most popular one being that the always sartorially splendid Edward VII “invented” this fashion. It is said that as his waistline expanded, his waistcoats and vests remained unbuttoned. Ah yes, Roch. Never fear, we covered the topic more extensively in our story on suit buttons. The outfit sounds appropriate, Richie. There is one thing we would recommend reconsidering: the bow tie color. We save our black bow ties for our black tie outfits (aka tuxedos). When not in a tux, we recommend a bow tie in a color. In this case, we would also suggest a patterned bow tie since the rest of the outfit is all solid colors. I ve been following your site for quite a few days and found it interesting. Need a help from you guys. I ve purchased a black casual shirt, khaki pants and black shoes to wear it on my friend’s wedding. Suddenly my friends are insisting to wear blazers. What colour of blazers will go with this combo? Tried finding but i feel no one can help me out more than you guys! Warning: What follows is some tough love. The original outfit is super-casual, so we’re not surprised that the groom asked for blazers. We’re only surprised that the groom didn’t tell you to wear a full suit. How do we resolve the situation? First, let go of the black shirt idea immediately. Unless the wedding is at a night club, a black shirt is not appropriate. Instead, go with a white shirt. You cannot go wrong with a white shirt. They look good on everyone and they have a bright and airy quality that is appropriate for a festive event like a wedding. As for the blazer, avoid the urge to go with black. Black blazers don’t do anyone any favors. If you’d like to opt for a dark color, go with a navy blue or charcoal gray which will contrast nicely with a white shirt but be much more forgiving to your hair and eye color and skin tone than black. Finally, a tie may still be optional, but since you’re adding a blazer, a pocket square is the smart choice. You can offset the color of your jacket with a saturated color in the pocket square, or just keep things simple with a white one. Either way, wearing one is essential to pulling off a sophisticated stylish look. Valentine’s day is fastly approaching and I wanted to dress in something different this year. I was thinking of a gray suit, with a black shirt and black shoes. The only conflict I have is deciding on what tie to wear. I was thinking of either a purple-gray-black patterned tie, red-gray-black pattern or just a solid color. Any feedback? If not these kind of ties, then what do you suggest? Our advice is not to wear a tie. Black shirts and ties rarely come off well. So if a black shirt is in the cards for this Valentine’s Day, we leave the tie in the closet. If you’re not married to the idea of a black shirt then there are some options to consider. Judging by your description of the outfit, it sounds like you’re going for the monochrome look. We approve. In that case, take a look at our story on the Accidental Minimalist where we lay out a framework for dressing with little or no frills but still looking great. Sounds like you’re a good candidate for our story on matching shirts and ties. There we lay out a system for matching patterns. We focused on neck ties, there, though. When it comes to pairing bow ties with shirts, we say err on the side of simpler. Choosing to wear a bow tie is already choosing the road less traveled. No need to overdo it. Avoid the kind of sartorial pyrotechnics that some guys try to pull off with busy patterned shirts and in-your-face bow ties. Stick with a solid white or light blue shirt. Treat a cardigan like a vest and leave the bottom button unbuttoned, Andrew. Better yet, leave two undone. I alternate between the first and last or the last two. Now you’re talking, Jovan. Two buttons undone on the vest is a varsity move. Nice! I meant the cardigan, but I’ve seen some guys pull it off on vests. Got it, J. As you noted, it works with both cardigans and vests. In both cases it’s a bit more fashion forward but we’ve got no problem with that. I don’t know that I’d call it that, but it’s stylish. 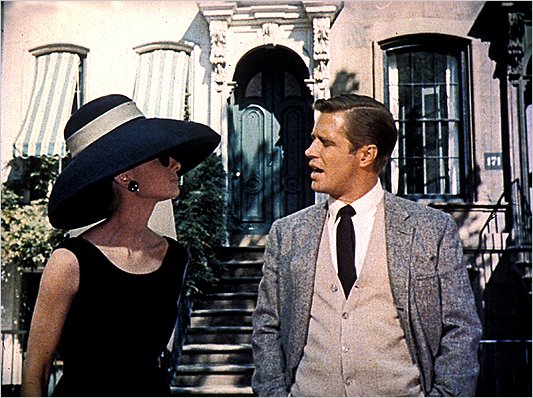 A good example is in Breakfast at Tiffany’s (and yes, that’s George Peppard before “The A-Team”).